Tour EUYO with Bernard Haitink, Vasily Petrenko, David Watkin, Katia Labeque, Marielle Labeque, Lorenza Borrani, Stefan Schweigert, Paul Watkins, Kai Frömbgen and Julian Rachlin. Grafenegg, Austria. Bratislava, Slovakia. Vienna, Austria. Ljubljana, Slovenia. Wroclaw, Poland. Warsaw, Poland. Berlin, Germany. Alpbach, Austria. Bolzano, Italy. Amsterdam, Netherlands. Interlaken Classics, Kursaal Interlaken. Festival de Paques, Grand Theatre de Provence & Perugia Musica Classica, Teatro Morlacchi. Hong Kong Academy of Performing Arts. School of the Arts Singapore. Kultursommer Nordhessen, Kongress Palais Kassel. BBC Proms, Royal Albert Hall. Grafenegg Festival, Austria. Bolzano Festival, Teatro Communale. Royal Concertgebouw, Amsterdam. Emirates Palace, Abu Dhabi. The Megaron, Thessaloniki. I hold a full, clean British driving license, held since 2008, and I am willing and able to drive small vans. 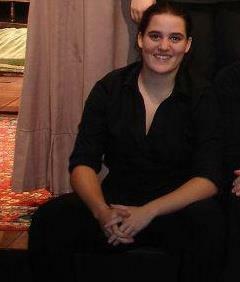 "Zoe worked as a stage hand for the Stage and Operations department here at the Royal Opera House Muscat. I found her to be conscientious, hard working and in every way a very dependable employee. She is a very reliable worker and is of excellent character; we have been extremely pleased with the service provided by Miss Zoe Fagg. I can recommend Miss Zoe Fagg without the slightest hesitation. I feel sure that she would bring to her work a genuine spirit of service. She would be an asset to any team and would be found to be helpful and efficient by all who would work with her. We wish her success with her career." "Zoe Fagg is a terrific stage manager in the area that matters to me most - she has excellent people skills; I've been consistently impressed with how she's been able to quietly but firmly organise large casts with diverse personalties whilst maintaining their respect and affection. Just as importantly she is a lovely person and a pleasure to have in the rehearsal room. She assembles and maintains a prompt copy with great efficiency and her board operating is also excellent. I thoroughly recommend her"
"Zoe is a confident woman who is hard working and committed to the productions. Zoe also has the added bonus of being technically able with lighting and sound equipment. I thoroughly recommend Zoe Fagg for any production companies that may be recruiting. A joy to work with on every level." "My name is Christopher Howell and I had the pleasure of working with Zoe Fagg in January and February 2013 on the first London revival of Chess, which I directed at The Union Theatre, Southwark. I found Zoe one of the most diligent and hard working Stage Managers' I have ever encountered. There was never a problem that she was not able to resolve. She is highly efficient and has a fantastic manner with fellow technicians, performers and the public alike. I would thoroughly recommend her to any employer as I believe she would be a major asset to any production." "We had the pleasure of employing Zoe this Spring for our rehearsal period in Greece on then onto Abu Dhabi for our Middle East debut. She was the Orchestral Stage Manager for our Symphony Orchestra made up of the best young players from the 28 countries of the European Union, ranging in age from 18 to 26. Zoe came to us at very short notice and instantly applied her experience and modern methodologies to ensuring she was fully briefed to step into the breach. She rose to this challenge seamlessly and instantly earned the respect of her direct colleagues, the rehearsal conductor and the orchestra. She was not afraid to approach anyone to get the information she needed to do her job well. She sensitively handled working with a local team used to an older (and male) incumbent in her role, and managed to win them over on her skills alone. Her calmness when getting a concert started was noted and she handled the local Greek Freight shipping company extremely well, ensuring a safe, efficient and very speedy pack up of the larger instruments in preparation to be flown out. Based on her experience of living in the Middle East she became a very welcome addition to the etiquette briefing session given to the orchestra prior to departing Greece. She spoke with authority and as she was closer to their age group than that of the staff, earned kudos with the orchestra. She struck exactly the right balance when socially mixing with the team and with her charges, and was a huge pleasure to have on board. Unafraid to ask for guidance on something she was unsure on, she fully demonstrated an open, active and interested approach to learning and self-betterment. Something that was very refreshing to see. Nothing about her behaviour was entrenched or ‘old’ school. Personally and professionally I would be delighted to work with her again on similar and other projects and wish her the very best in the interim."